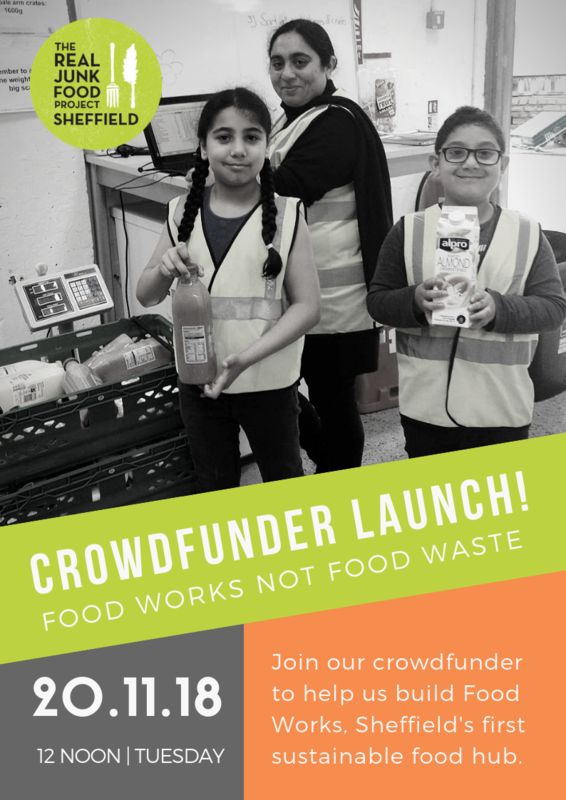 On Tuesday 20th November at 12:00 we will launch our first ever crowdfunding campaign to build Food Works not Food Waste for Sheffield! Food Works will be the sustainable food hub for Sheffield – transforming wasted food into valued food. We’ll be making a real dent in food waste, feeding people and sharing skills. We’ll continue doing all the fantastic work we already do at The Real Junk Food Project Sheffield under a new, shorter name with a much bigger mission! We go live on Tuesday 20th November at midday with loads of great rewards including Christmas hampers, refillable keep cups and even at home private dining! We’re looking to raise £50k to secure a long term warehouse lease, invest in commercial refrigeration units and onsite kitchen facilities to help us really stamp out food waste in Sheffield. To be in with the biggest chance of reaching our goal we need to get as many people as possible to hear/read/see the crowdfunding campaign. You can help enormously by simply sharing it!